Paul Gallihawk was competing in his first triathlon. Saturday's triathlon began with a 750m swim. The man, named locally as Paul Gallihawk, had been missing since the 750m swim section of the event when it was noticed that one bike was left uncollected when all the other competitors went through. 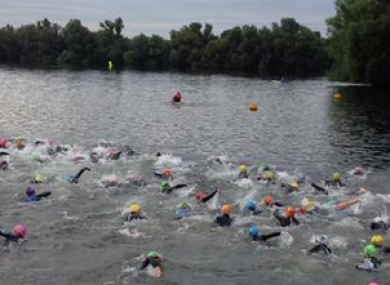 The swimming leg was the first section of the event on Saturday and a search of Leybourne Lakes in Kent has been underway since. In a statement released to media today, local police say they have found a body. Formal identification of the body has yet take place. The Ocean Lakes Triathlon released a statement following the event saying that they were in shock at what happened. Paul Gallihawk’s Go Fund Me page set up before the triathlon says that he was raising money for King’s College Hospital prior to the event. It notes that the hospital had looked after his father throughout 2014 and that the event was his first ever attempt at a triathlon. Since his disappearance, donations to the page have raced past his £300 target to nearly £5,000 and rising. Email “Body found in search for man who went missing during triathlon swim ”. Feedback on “Body found in search for man who went missing during triathlon swim ”.